High quality filtration of water (water purification) makes the base of success in breeding of Japanese KOI carp. Filter is incorporated in the system by professional firm. The filter is made of polypropylene plates and it is of rectangular, square or cylindric shape. A rectangular filter with 3 – 5 filtration chambers is sufficient for small ponds. Cylindric filters are used for large ponds of about 100 m2 and they are often aligned in series. The filter is combined as a mechanical and biological one. Water from the last chamber, the so-called „pumping chamber“ is pumped through the UV-emittor back to the lagoon part of the pond if this exists. The lagoon is a place with the least depth of the pond (see diagram). 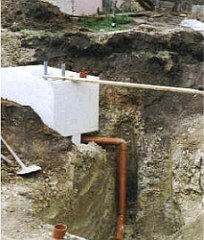 Apart from it, water inlet can be placed also on another site of the shallow part of the pond. This inflow may be equipped with aeration used for oxygenation of water in the pond. Plants in the lagoon part of the pond should be protected against carp because of damage. Considering the selection of plants, there are no regulations in association with the fish reared. Plants, either the mud-, or wetland ones, are just a question of aesthetics and we will leave the choice fully upon the garden architect. When building their ponds, the die-hard KOI carp breeders do not create any lagoons, anyway. Setting up the filtration system. This procedure belongs to the basic conditions of successful breeding of ornamental fish at all. In a newly built pond and filter, there is not enough bacteria to decompose nitrogenic substances, arising as a metabolic product of organisms living and growing in the pond. We have to wait a certain time (depending on the time of the year, size of the pond and water temperature at least two weeks and 3 – 5 weeks as an optimum) until a sufficient amount of bacteria arise in the pond and in the filter, to be able to decompose metabolites originating when breeding the carps. In order to speed up the entire process, it is possible to add a so-called starting culture of bacteria which accelerates growth of the essential amount of the microorganisms. If we omit the whole procedure, our fish would have health problems with the highest likelihood.